Claire covers a lot of fantastic things on her blog including recipes, craft projects, nail art, beauty, hair, fashion and reviews. I highly recommend that you check it out, as there is a post for everyone. Claire tells me that this fajita recipe is one of her favorite dinner/lunch options, and she loves making it for company. You can add other vegetables but I choose not to. Please note ** Never use a spoon/knife you have been using to stir/cut chicken to stir/cut your onions. 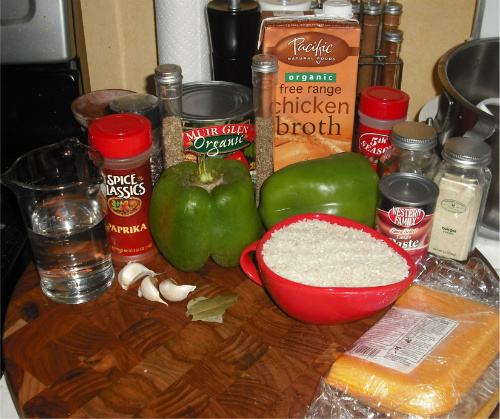 Set all your ingredients out so everything is within reach. Warm some cooking oil in a frying pan while you cut your onions (I always chop my onions first) You can cut them to any size you want - My onions are cut up pretty small as I like them to be quite crispy. 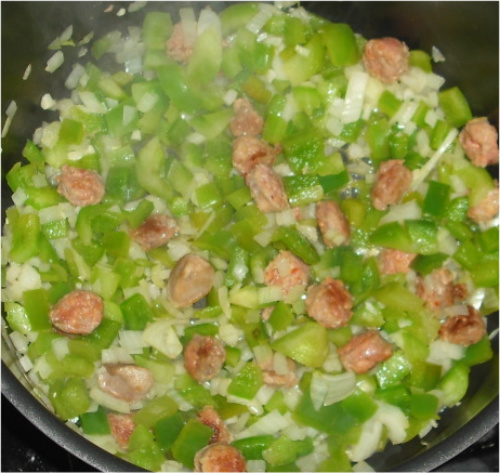 Add the chopped onions to the frying pan. Don't forget to stir your onions every now and again. Warm some cooking oil in a wok or large frying pan while you slice your chicken breasts (or beef) into sections/strips, removing all fatty bits and veins! It is best to cut the chicken into small sections or strips so it fits easily into your wraps. Cook the chicken until all the pink has turned white but leave on the heat as the inside may still be pink. You can check if the chicken is ready by choosing the largest strip and cutting into it to see if it is pink, if it isn't the chicken is ready. If it is pink just cook a little longer. Once the chicken is ready or just about, then add the bbq seasoning (this is optional) but I find it yummy! There are loads of seasoning sachets already made out there or you can make your own. The onions should be cooked by now, you can leave them like this but I add some sugar (brown sugar works best) and mix it in with the onions in the frying pan. 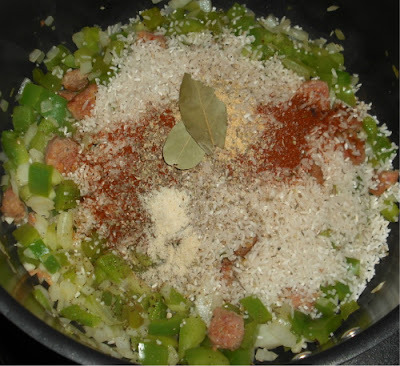 This caramelizes the onions and make them taste gorgeous in your wraps! Once the onions are ready put them into a dish/serving plate. This is where it gets confusing. I don't like the usual fajita sauce on my chicken but Tim does. I split the chicken in to two frying pans/woks. Mine is just the plain cooked chicken strips with the bbq seasoning thrown in so I add it to the pan I used for the onions. Tim's chicken is in the other frying pan/wok so I add a sauce to it and leave to simmer. Add sweetcorn to a microwaveable dish and cover with water. The sweetcorn can be the frozen or the tinned kind. You can also use a saucepan to cook the sweetcorn. Heat the sweetcorn for 30 seconds and stir, then another 30 seconds. Drain the water and put back into the microwave for another 30 seconds. You will need to adjust the times for certain microwaves and if you are using a saucepan then you will have to boil the sweetcorn for 3 minutes at least. Grate your cheese into a bowl or add the grated cheese to a serving dish like the one I have used below. Add Mayo/Reduced fat Mayo to a cup or tupperware dish and add garlic paste or chopped garlic and mix. I coat my wraps in garlic mayo before adding chicken, cheese, sweetcorn and onions... yum! By this stage everything is ready so you can add the wraps to a plate, place them in the microwave and heat for 30 seconds. 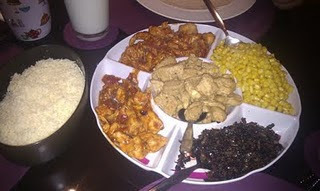 Serve the chicken, sweetcorn, cheese, onions and wraps and give each person eating a plate to roll their wraps. 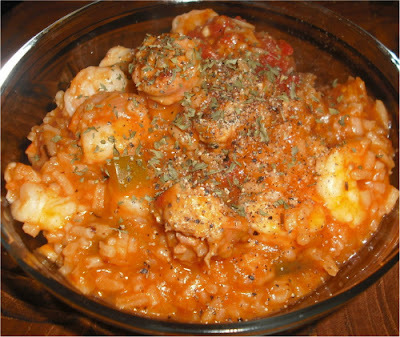 Sending out a huge thank you to Claire for sharing this yummy recipe, and I hope you all will try it and also check out her blog. cranberry juice to taste depending on how strong you like your shots. I am going to go with the standard 'shake with cracked ice and strain' method here because I have never made it before and I usually prefer my drinks chilled. FYI- when you want to chill a shot down, but not water it down, make sure you FILL the shaker with ice. Most people tend to use too little ice thinking that too much will water it down a lot when in fact the opposite is true. The idea is to cool down the drink very quickly thereby melting as little ice as possible. More ice in the shaker=a quicker cool down. Less ice takes longer to cool it, and melts more of the ice. So fill that shaker up with ice, shake the bajeebuz out of it, and strain it into the appropriate shooter or martini glasses. My new favourite pork tenderloin. Yield: 1 cup of marinade. 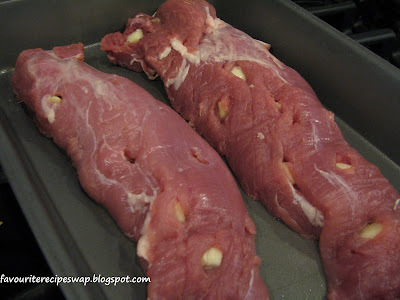 Take tenderloins out of package. Rinse and pat dry. Place in a 9x13-inch Pyrex sprayed with non-stick cooking spray. Take a paring knife and poke holes in the tenderloins (on the top side only) about an inch deep. Peel garlic cloves and quarter each clove of garlic-lengthwise. If they're really big, cut them a bit smaller- about the size of slivered almonds. Place the garlic slivers in each pocket. Set aside while making marinade. whisk together all the ingredients except for the olive oil. Then slowly drizzle the olive oil while still whisking. 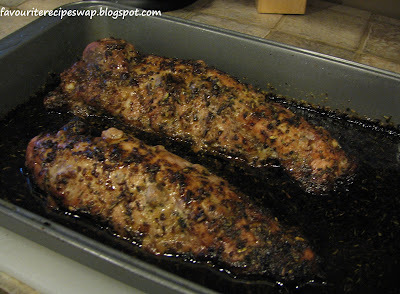 Pour the mixture over the tenderloins and put into preheated oven. Bake, uncovered, for 45 minutes, basting once halfway through the baking process. You can see here that I actually overcooked it a little. It should be taken out of the oven at about 150 degrees, and left to rest, covered with tinfoil, on the counter for about 10 minutes, During that time the internal temperature will continue to rise and reach the optimal temperature of 160. My meat thermometer did not want to work, and I overcooked it a tad. It should still be slightly pink in the center. It was still juicy though. 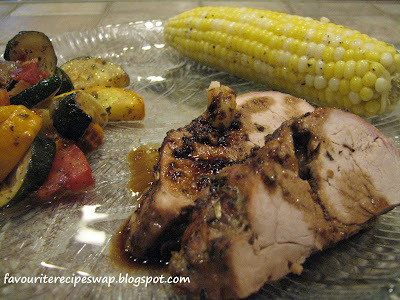 I served this with a zucchini vegetable concoction, and fresh corn on the cob. 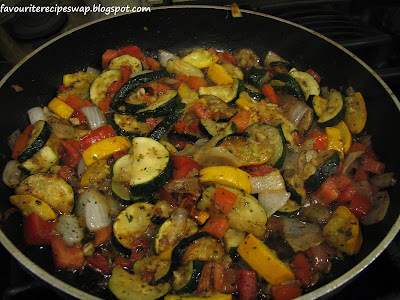 For the vegetable concoction, I cut up Zucchini, onion and garlic and stir-fry that in a little vegetable oil until it starts to brown a little, then I add diced tomatoes, basil or whatever spices I feel like at the time, 2 tablespoons of balsamic vinegar and a little salt and pepper. I often top this with goat cheese or feta cheese on the plates. Spoon a little of the pan sauce over the pork medallions after you cut them up. Tomorrow we are heading to Pelee Island for the better part of the week, and since there isn't really any access to groceries etc over there we have to bring all of our food and water with us. On the menu for the week are simple suppers, all BBQ'd and simple sides that will leave us with left overs to pick at for lunches and snacks. One thing I have made ahead of time is coleslaw. It's easy, inexpensive and will last for the duration of our stay. It's even a yummy addition to a wrap. I used a very simple basic recipe, and there are about elebenty billion different versions of coleslaw. I chose not to put onions in this one, simply because I don't want to deal with the fallout of eating raw onions every day for a week. Onions of your choice- green onions, sweet onion, red onion. 1 1/4 cup Hellmans Mayonnaise **note- I much prefer actual regular full fat mayo for this, because the 1/2 fat mayo has a completely different taste-more like Miracle Whip- and in my opinion doesn't go as well in this dressing. But, other than from a flavour perspective low fat is fine if you want to use that. Shred the cabbage on a mandolin or cut it veeeerrryyy thinly. OR go buy a bag of the pre-cut stuff. Place that in a bowl with a few generous handfulls of the matchstick cut carrots, and onions if you are using them. Mix all the ingredients for the dressing together in a glass jar with a tight lid, shake it up and let it sit for an hour or so in the fridge. Dump it all together and give it a good stir, or mix it up with your hands. I store mine in a large ziploc freezer bag. It takes up less room, easily transportable for vacation, and you can squeeze all the air out. I usually just flip it over a few times before I serve it to redistribute the dressing. 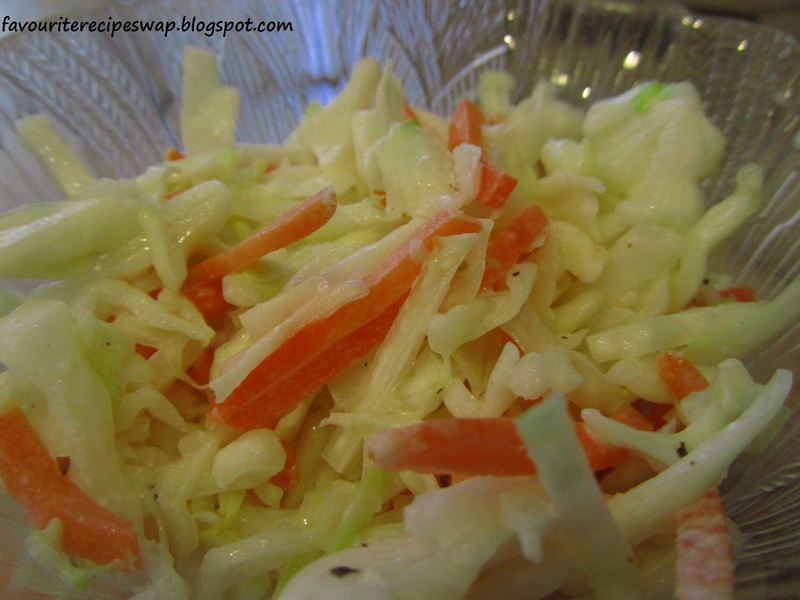 I would love to know what your likes and dislikes are for coleslaw, or if you have a favourite recipe for it. This is a very quick, almost throw together recipe and while it was good, it needs a little tweaking for next time. More heat, and more curry paste. That's about it. And I think I will keep some of the green onions aside for tossing in at the last minute so they retain a bit more colour. They were tasty, but lost colour in the cooking process. Sprinkle the chicken with salt. Heat1/2 tsp oil in a large non stick skillet over meadium- high heat. Add the chicken and cook, turning occasionally until browned and cooked through. About 5 minutes. 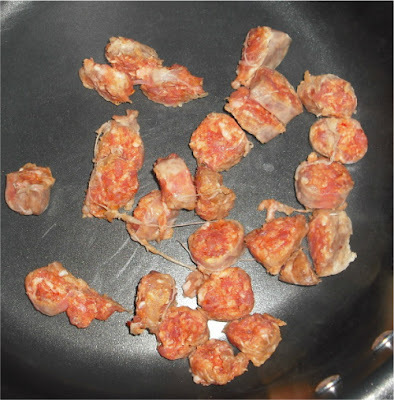 Remove from pan, and keep warm. Add the remaining 1/2 tsp oil to the skillet. 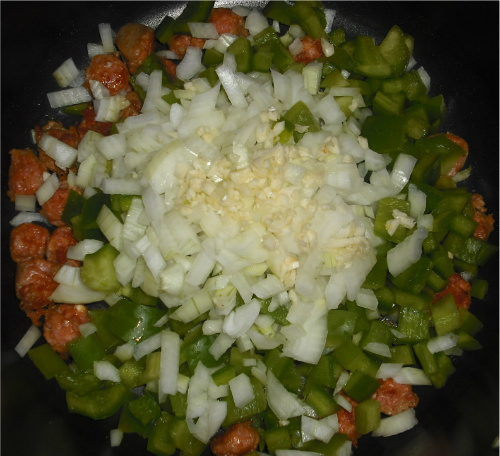 Add the bell pepper and most of the scallions ( reserve some to add at the end so they retain some colour). Cook, stirring until the scallions turn bright green:about 1 minute. 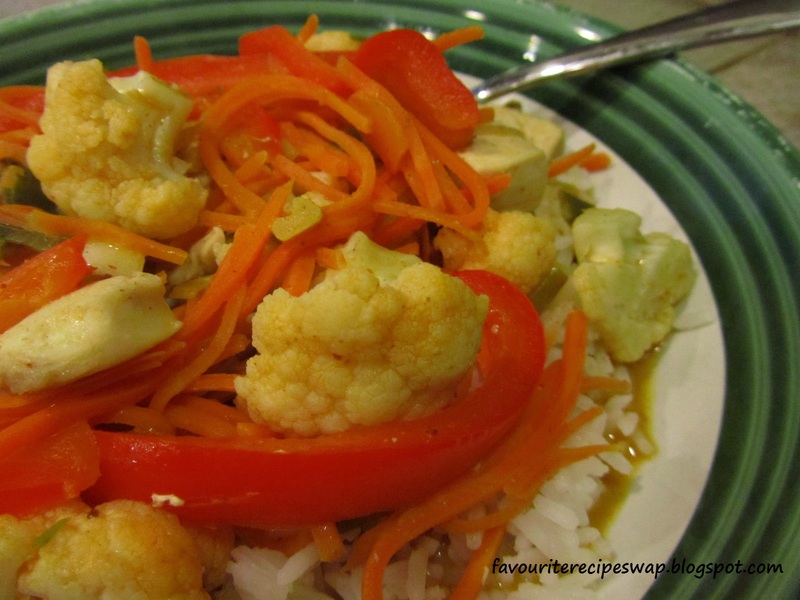 Stir in the coconut milk, cauliflower and carrots; bring to a boil. 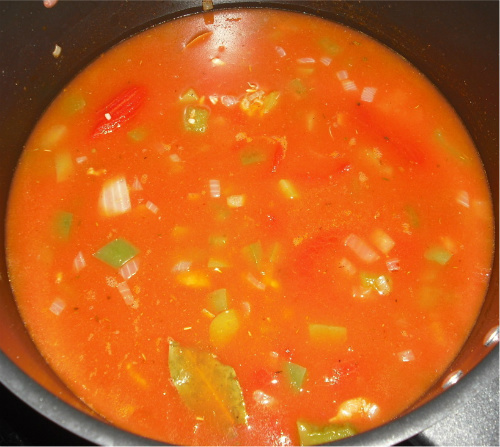 Reduce heat and simmer, covered, stirring occasionally until the vegetables are tender; about 6 minutes longer. 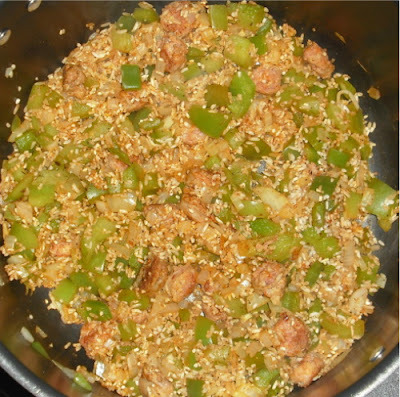 Return the chicken to the skillet and cook until heated through; about 1 minute. I like to serve this with jasmine or basmati rice. 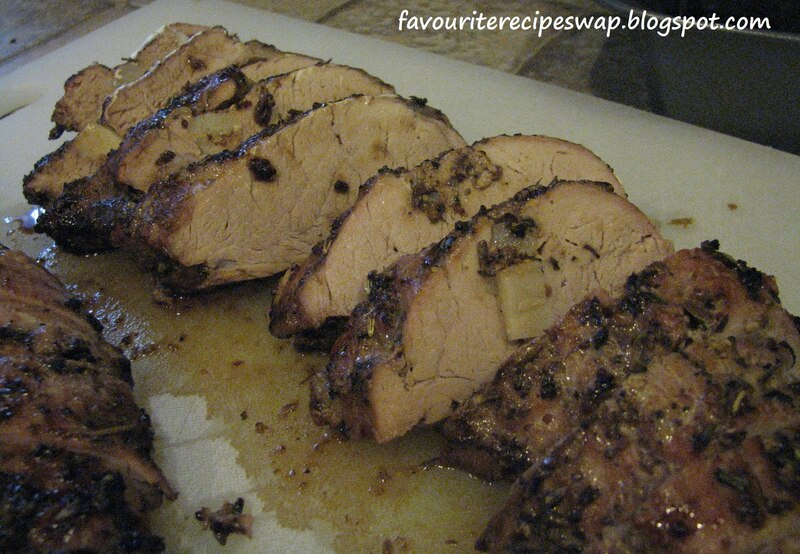 We don't eat a huge amount of pork but a tenderloin is one of our favourite cuts. 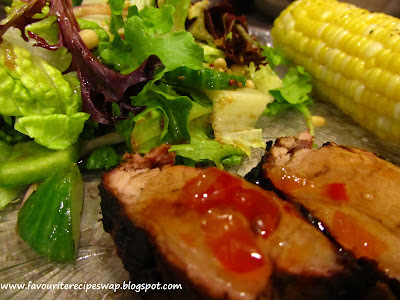 It is easy to BBQ, and is always moist and juicy-If you don't over cook it. The trick is to take it off the grill when it reaches about 160 degrees, ( use a meat thermometer, it will be your new best friend) cover it and let it rest on the counter for 10 minutes before slicing. The temp will continue to go up, and the juices will spread more evenly through the roast. It should be just slightly pink on the inside. This does not mean it's underdone, or rare. Alternatively you can cut the tenderloin into medallions bake them or pan fry them. I will post my favourite recipe for that soon as well. It's with apples and celery and cream... yum. Whisk everything together in a small bowl, and put the pork in a large ziploc bag with the marinade for at least 30 minutes or over night. Sear the tenderloins on all sides, then grill for about 20-30 minutes, rotating every 10 minutes, until the internal temperature is 160 degrees. Try to let it rest, covered for about 10 minutes before slicing. I served this one with red pepper jelly because it was over cooked a little... oops. 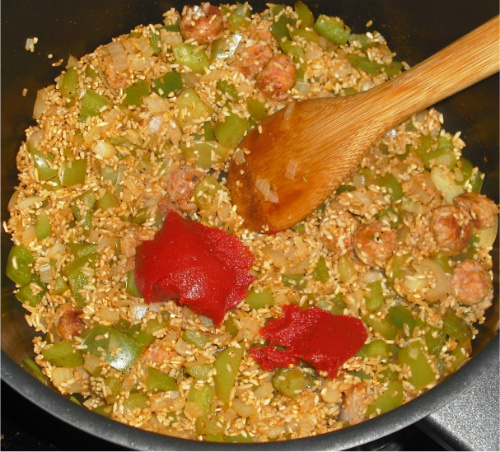 If you like it a little sweeter you can add a couple tsps of sugar, honey or sugar substitute. You can just dump it all in a jar with a tight fitting lid and shake it up, but if you want it to really emulsify you pour the vinegar and lemon juice in a bowl and slowly drizzle the olive oil in while whisking like mad to get it to emulsify. It doesn't really affect the taste, so it's not necessary really. I like to serve this dressing over romaine lettuce and mixed greens with red onion, red or orange pepper, nuts of some sort ( usually almonds or pine nuts or pecans) and some dried cranberries.